First up - flying over for their first ever UK show, Denmark's The Entrepreneurs. Ones of the bands on everyone's lips out at the Eurosonic Festival in the Netherlands earlier this year, they've been compared to Sonic Youth and Japandroids by some. Think earworm, hummable melodies and riffs but dripping in distortion. ‘Noise and Romance’ is the name of the album, but if you needed one entry point track, report to YouTube for the insanely catchy 'Joaquin' then meet us back here. Back again? Great - very good, isn’t it. Next up - Katie Dove-Dixon. She writes deliciously dark pop, inspired by sci-fi novels, Sharon Van Etten, the Cocteau Twins and, y’know, the apocalypse. We've only heard a couple of singles so far (her debut EP 'Sadness-Lite' is imminent in May) - but if you needed a jumping on point, new single 'Good Kids' is very good incitement to see her live at The Shack. 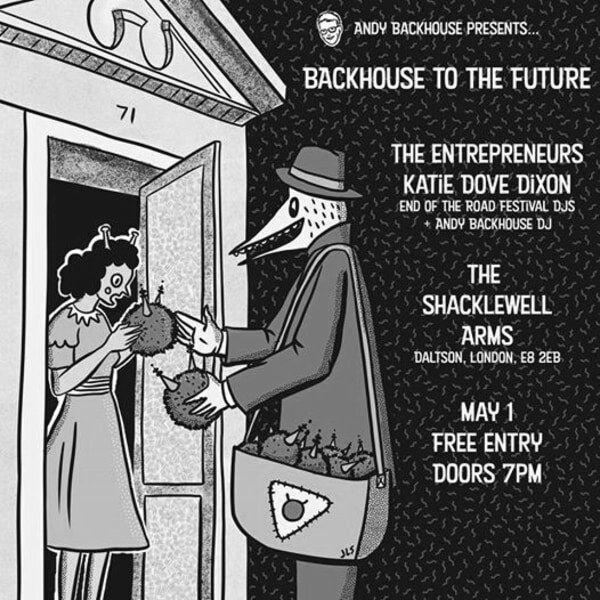 Backhouse to the Future presents the future of music, live at indie haven The Shacklewell Arms. Hosted by Amazing Radio and BBC Music Introducing DJ Andy Backhouse. Andy presents the best oddball pop on Amazing Radio, Sunday nights from 7-9pm.